Jehalani Galloway, a 6-1 175 pound WR from Providence, R.I. has Tweeted he's received an offer from UMass. Besides UMass, Galloway has offers from BC and Army. Congrats to the Fall sports programs! Mississippi State gives HC Dan Muellen a four-year contract extension. The Bulldogs QB Nick Fitzgerald will be All-Sec in 2017 reports a SEC analyst. UMass meets Mississippi State in Starkville on November 4th. SB Nation has the Spring practice start date and Spring game dates for about half of the Minutemen's schedule. Betro holds an offer from Syracuse. This article on Syracuse recruiting mentions him. "Groton (Mass.) Lawrence Academy's Ryan Betro already has holds offers from Syracuse and Sacred Heart, and he is getting interest from Boston College and Connecticut. He made recent unofficial visits to Syracuse and Boston College." UMass has a Junior Day in Amherst yesterday. A number of recruits picked up UMass offers. I'll start covering the offers this week. Mike Traini of "Fight Massachusetts" has written he'll provide a list of the attendees. Phil Steele has a list of returning starters on all FBS teams. The Minutemen are in the middle of the pack with 6 offense and 8 defensive starters returning. In 2017, hopefully the "Didgeridude Guy" will actually come to the stadium and play his instrument. iSportsWeb.com says Victor Cruz makes sense for the Patriots. UMass formally announces Ed Pinkham joins the Minutemen staff as defensive coordinator. I'll add more updates as they happen. OT, but the Old Chapel is finally open. I plan on taking a look when I'm on campus this fall. 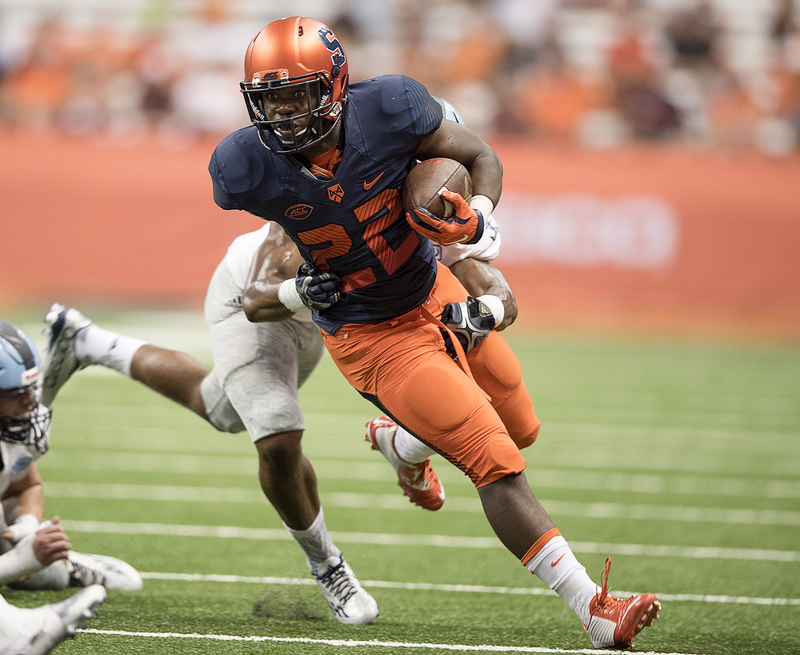 Matty Vautour reports former Syracuse RB Jordan Fredericks officially visits UMass this weekend. Fredericks was a three-star RB from Inwood, NY. 247Sports has his rushing stats for Syracuse. A Syracuse fan site discusses his leaving the Orange. Several recruiting services indicate UMass has offered to Finn Dirstine, a 6-5 320 pound OG from Lawrence Academy in MA. Hudl.com has video. Note the 4.8 forty for a 320 pound OL. "Finn Dirstine, an offensive guard from Groton (Mass.) Lawrence, holds a handful of offers, including one from Boston College. Beating the in-state Eagles is always tough for schools, but Illinois, Miami, Syracuse, Massachusetts and Yale each offered. Dirstine plays with power and a low pad level." This article lists Adam Breneman as one of the top five returning TE's in college football for 2017. BYU, who plays UMass in 2019 adds Tennessee to their schedule. UMass will visit Neyland Stadium on September 23rd. Mrs Blog and I already have plans to attend. The Minutemen will end their 2017 season against BYU on November 18th. Speaking of 2019, this year's October 21st opponent Georgia Southern will add Maine to their schedule that year. Gator WR Dre Massey, who tore his ACL against the Minutemen last year, returns to practice. Ed Pinkham, our new defensive coordinator, Tweets he had a good time meeting UMass fans last night at the UMass Club. 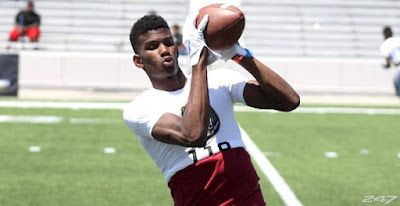 Erick Hallett, a 5-10 170 pound DB from Cypress, TX has Tweeted he's received an offer from UMass. NCSA has some different stats. This article from Scout.com dated June 2016 features Hallett. 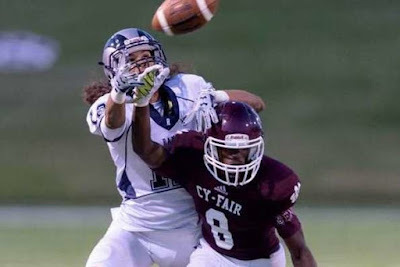 Right now, Hallett only other offer is from FVS Stephen F. Austin. Drawing interest from Texas Tech, SMU and TCU. I've blogged about Matt Valecce, a 6-5 205 pound pro-style QB from the Bronx, NY before. 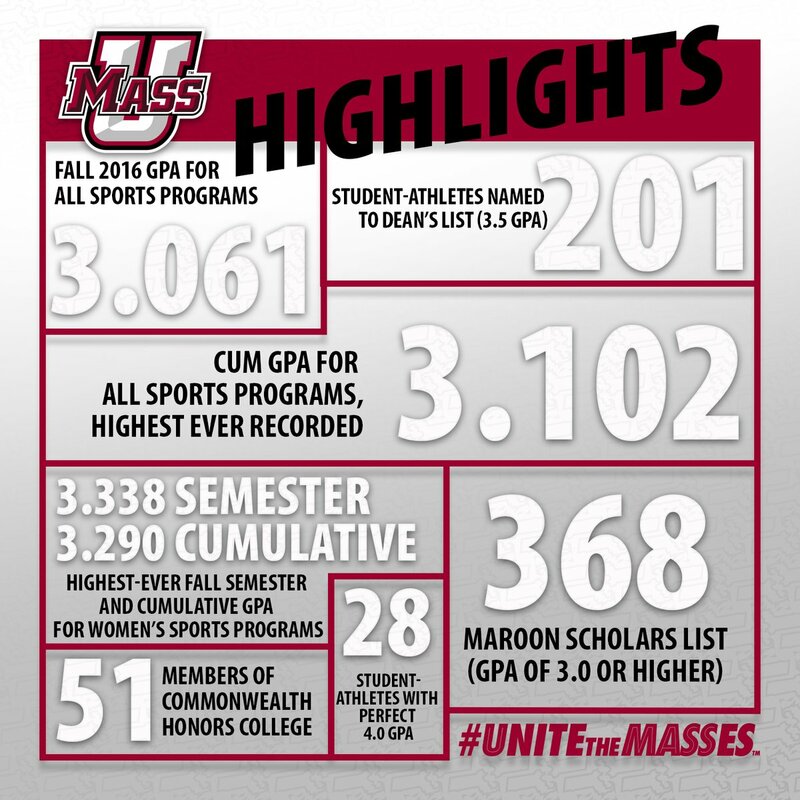 Mike Traini of "Fight Massachusetts" has a post with quotes from Valecce about his being recruited by UMass. Brown is currently Valecce's only other offer. 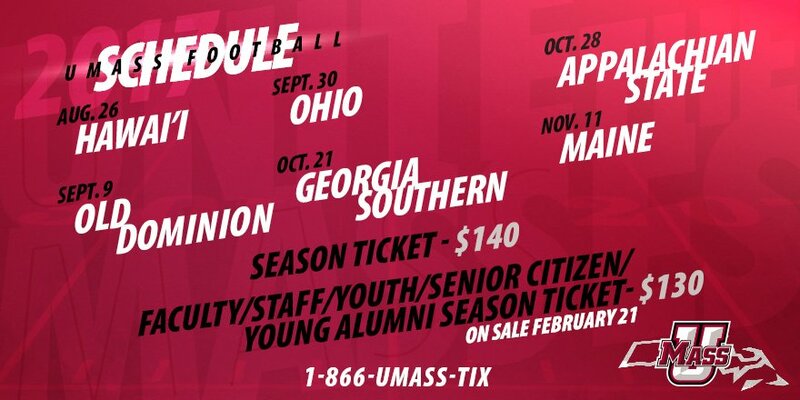 UMass season tickets for 2017 go on sale today. UMass announcement. Mike Traini of "Fight Massachusetts" has a post on the season ticket changes for 2017. Temple's plans for a new stadium may be on hold. USF, the Minutemen's October 14th 2017 opponent, is coming off the best season in its program history. The Bulls may be just as good this year. 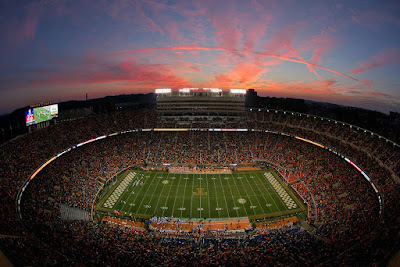 Appalachian State, a October 28th visitor to McGuirk, will have a new co-defensive coordinator. 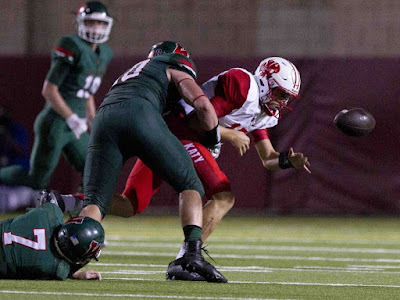 I've blogged about Zachary Loane, a 6-0 235 pound DE from Woodlands, TX before. Mike Traini of "Fight Massachusetts" has a post on Loane with some quotes by him with his reasons for becoming involved with the Minutemen program. Loane probably didn't get the attention he deserved because of his size. Some recruiting services had him as shorter than six feet. However, a player's height does not measure the size of his motor. James Ihedigbo walked on to UMass and became an All-American and is still playing in the NFL. Hopefully, Loane will be on the field making tackles against SEC teams and proving wrong all the Texas schools who didn't recruit him. Several recruiting services report UMass has offered to Devin Hayes a 6-6 250 pound OT/DE from Orlando, FL. This article from the Orlando Sentinel features Hayes. "Hayes is fairly raw with limited go-to moves at his disposal, but fires off the ball with decent pad level. He holds his own and flashes the ability to shed blockers and put a hat on the football, but is still in the infantile stage of his development. "My toughness, being physical, my speed, being a team player, and being a smart player on and off the field," Hayes said when asked about his strengths as a prospect." Besides UMass, Hayes has offers from Bowling Green, FIU, Rutgers and USF. Saw these Instagrams both on Mike Traini's Twitter feed and Coach Joe Connolly's Instagram. Mostly Minutemen players doing some heavy squats. BTW, I'm hoping to set the New Hampshire Master 4a squat record in the 83 kilogram weight class on April 29th in the New Hampshire State Championship Powerlifting meet. Boston College announced yesterday A.D. Brad bates will step down at the end of the academic year. University of Hawii opens Spring camp. Coastal Carolina dismisses a potential starting QB. Victor Cruz visits the Carolina Panthers. The NY Post has why Cruz's visit to Carolina makes sense. When new UMass DC Ed Pinkham was coaching at Rutgers, he nearly recruited Denver QB Trevor Siemian for the Scarlet Knights. 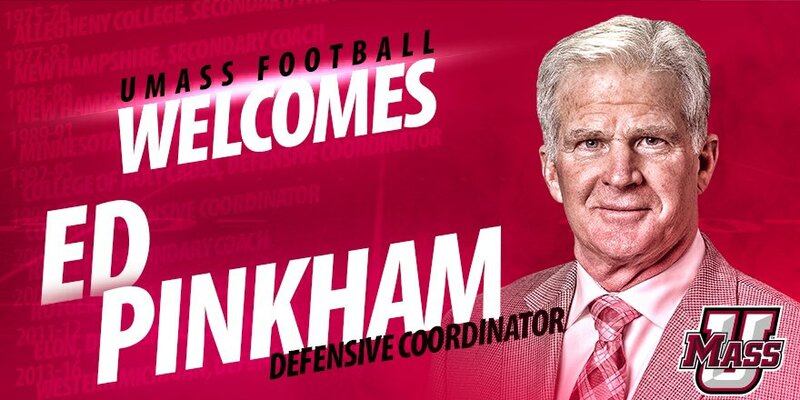 The article says Pinkham mainly recruited Florida for Rutgers. This article from December 2016 reports P.J. Fleck let his defensive coordinator handle the "X's and O's". This story from 2013 relates how Pinkham introduced his defensive system to the Western Michigan players. "The Broncos are hoping Pinkham can find the magic he had at Rutgers, where he was the Scarlet Knights’ defensive coordinator from 2009-10. In 2009, Rutgers led the nation in tackles for loss and was second in turnover margin. The program was also in the top 20 in the country in rushing defense, scoring defense and total defense." Victor Cruz gets a mention from Denver. Also drawing interest from the Carolina Panthers. 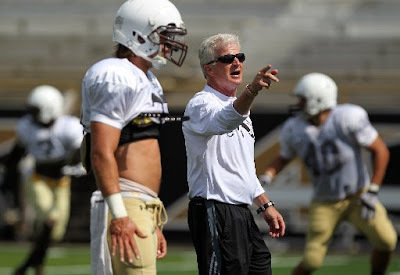 UPDATE: Ed Pinkham's Twitter feed lists him as "UMass defensive coordinator"
Matty Vautour reports UMass has hired former Western Michigan defensive coordinator Ed Pinkham for the same position with the Minutemen. Kyle DeLuz has a post on the hiring at the UMass Daily Collegian. Mike Traini of "Fight Massachusetts" has a report on Pinkham's hiring. Was interviewed for the head coaching job with the Broncos. Mentioned as an assistant who could move to the SEC. As it happens, Mrs Blog and I were talking about the potential defensive coordinator hire on the way back from Amherst yesterday. Good thing I'm not a hockey fan, between basketball and football, there have been a lot of long drives back to New Hampshire over the the last few years. This seems to be a good hire. Pinkham was a FBS defensive coordinator for a successful team. Mrs Blog and I were speculating about a FCS guy or an internal hire. He is a veteran coach and UMass would have to pay more than for a younger man. I assume UMass AD Ryan Bamford was willing to make the extra expenditure. Besides X's and O's, make no mistake what moved Western Michigan from 0-11 to 13-1 and a trip to the Cotton Bowl was recruiting. Hopefully, some of T.J. Fleck's recruiting prowess rubbed off on Pinkham. I have no idea what would lure recruits to Kalamazoo could be, but Amherst should be at least equal. Pinkham needs to identify and recruit defensive players for the Minutemen. The old saw is offensive sells the tickets, but defense wins the games. Tough to sell tickets for a 2-10 team. You probably get more bang for your bucks with defense. Western Michigan was #15 in scoring defense in 2016 allowing 277 total points and 19.8 points per game. The Broncos were #26 in total defense last year and allowed 353.4 yards a game. Western Michigan was #25 in passing yards allowed with 200.1 yards a game. UMass was #106 and allowed a 64.5% completion ratio. Pinkham's pass defense completion was 56.2 %. The Broncos gave up 17 passing TD's; UMass gave up 27. Hiring Pinkham looks to be a positive addition to UMass football. 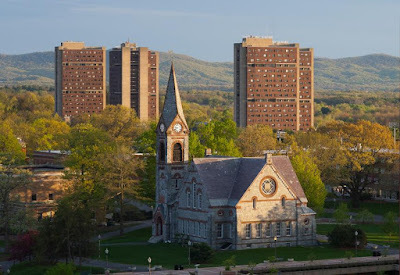 Welcome to him and Go UMass! 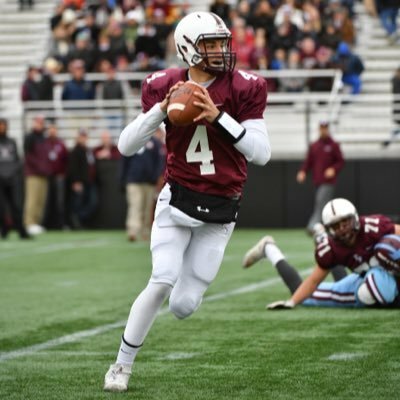 Matt Valecce, a 6-5 205 pound pro-style QB from the Bronx, NY has Tweeted he's received an offer from UMass. MaxPreps has stats---almost 6,700 passing yards with 71 TD's. UMass is Valecce's first FBS offer. Has an offer from Brown. 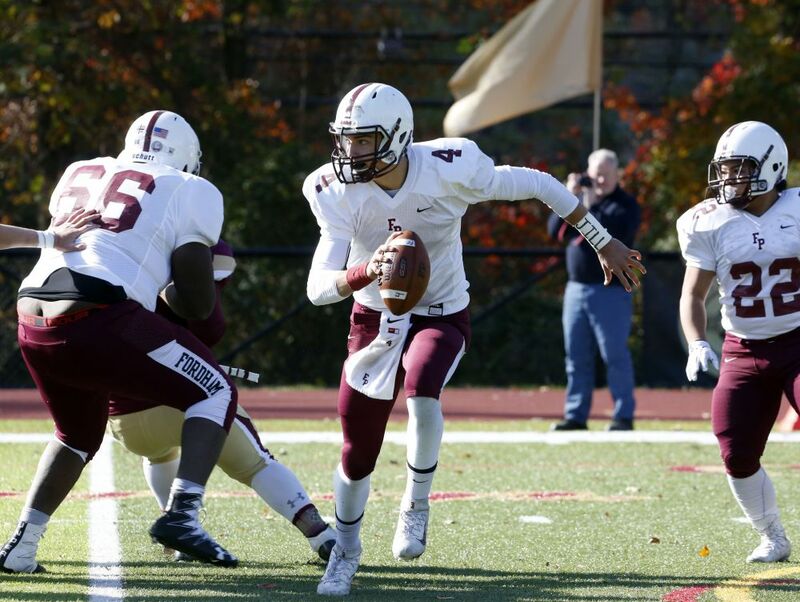 Drawing interest from Ivy league teams plus Syracuse and Rutgers. 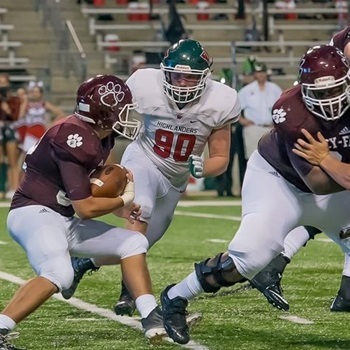 I've blogged about Justin Johnson, a 6-7 340 pound OT several times before. Johnson just added an offer from Michigan State. Besides UMass, Johnson has offers from BC, Temple and Syracuse from the Northeast. Zachary Loane, a 6-0 235 DE from the Woodlands, TX has Tweeted he'll joining UMass as a preferred walk-on. Loane will join Michael Curtis, D'Shan Harley and Tedrick Lowery as Texas natives playing for UMass. 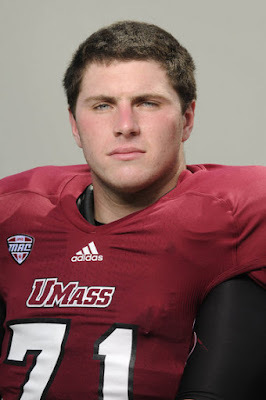 Mike Traini of "Fight Massachusetts" has some news and notes about UMass football. Liberty University has received NCAA authorization to move to FBS. They'll be an independent like UMass. Right from the git-go, the Flames have said going FBS was a long term goal, and they've been planing for it right along. Should at least help UMass with scheduling. The more independents, the merrier. The Washington Post has a piece that focuses on Liberty AD Ian McCaw. Art Stapleton joins Matty Vautour's podcast to discuss Victor Cruz and other UMass sports. Speaking of Victor Cruz, could he join Tajae Sharpe in Tennessee? The Yankees and the Red Sox go head-to-head to host the Army-Navy game. 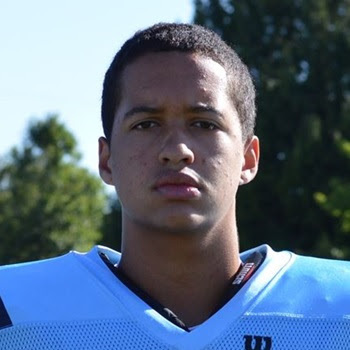 Marco Brewer, a 6-4 280 pound OL from Corvallis, OR has Tweeted he's received an offer from UMass. Hudl.com has some video and stats. "Which school(s) are recruiting you the hardest at this time? MB: Oregon State, Oregon, Washington State, University of Massachusetts, Columbia, Princeton, Portland state, Eastern Washington. Do you have spring or summer plans in regards to camps or visits? Will you try to go to the Ducks spring game? MB: I am trying to go to some junior days and their camps. Also the Opening. I'm planning on it, I went last year"
This article from November of 2016 features Brewer. Besides UMass, Brewer has an offer from Nevada. Drawing interest from a number of Power Five schools. When Hawaii opens the 2017 season against UMass, both schools will have new defensive coordinators. Minnesota pays Western Michigan $50K to transfer P.J. Fleck's "row the boat" trademark to the Gophers. Talking about UMass needing another RB: Miami transfer Gus Edwards is looking for a home in the Northeast. At 6-1 230 he'd be the big back UMass has lacked since the move to FBS. Edwards' Miami bio. Fenway Park bids to host the Army-Navy game. 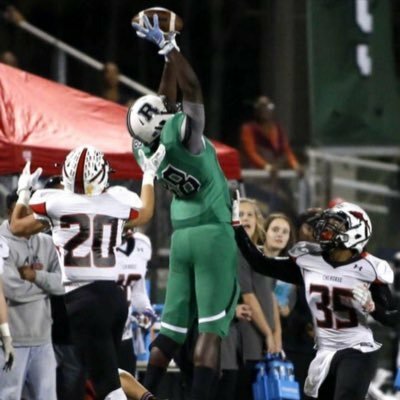 Several recruiting services indicate UMass has offered to Tyneil Hopper, a 6-3 225 pound TE from Rosewell, GA. This article from yesterday features Hopper. "Hopper’s eight-deep offer sheet looks like this: Kentucky, Wake Forest, Louisville, North Carolina, Illinois, Auburn, Alabama and UMass. North Carolina was an early leader — in the public’s mind, at least — because of the Porter connection and Hopper’s older brother. Auburn and Alabama emerged as contenders the second both sides of the Iron Bowl rivalry sent out offers to Hopper. For now, however, Hopper remains patient. Hopper has eight offers, seven of them from Power Five schools including Alabama and Auburn. UMass season tickets for 2017 go on sale on February 21st. The tickets have some enhanced benefits this year. 2017 will be my 41st consecutive year with season tickets to UMass football. The Worcester Telegram has a post that remembers Wachusett Regional football coach and athletic director Rich Lewis who played football for UMass in the early 60's. CBS Local says Victor Cruz's underdog story won't be soon forgotten. Giants wire has five possible landing spots for Cruz. James Ihedigbo hopes he can give Buffalo fans a trip to the playoffs. Trey Dean, a 6-2 180 pound DB from Hampton, GA has Tweeted he's received an offer from UMass. 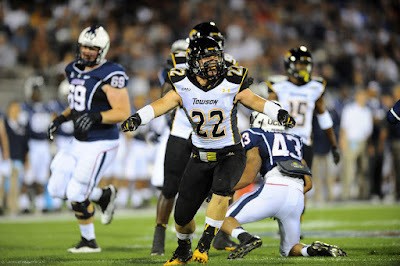 "As a junior, Dean recorded 50 tackles, broke up 14 passes and picked off four others. Dean isn’t ready to name a shortlist and he’s in no hurry to end the recruiting process. “I’m just taking it slow,” he said." Dean has 24 offers mostly from Power Five schools including Notre Dame, Penn State and Alabama. 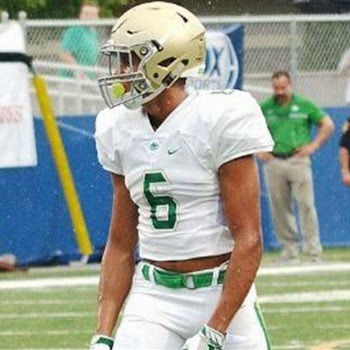 Bryson Richardson, a 6-0 185 pound Safety from Buford, GA has Tweeted he's received an offer from UMass. Hudl.com has video and some stats. 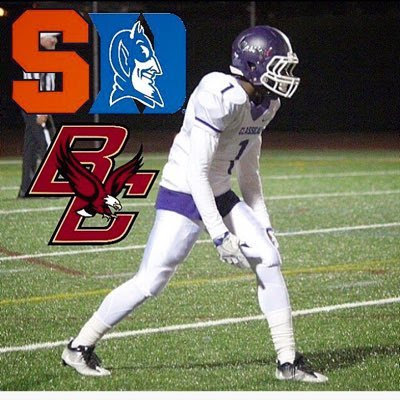 Richardson currently holds nine offers, with UMass as the only team from the Northeast. 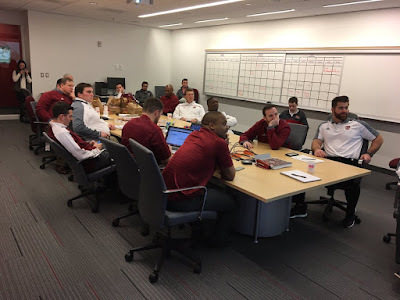 UMass AD Ryan Bamford Tweets we'll have a new defensive coordinator by Football Night in Boston. FanRag.com discusses Mississippi State's top issues for 2017. Giving up 35 points to UMass last year is one of them. Rutgers signs a six-year deal with Adidas. Note UMass is one of 25 other teams with contracts with Adidas. The Giants release Victor Cruz. Stories from NFL.com and the NY Post. Elija Godwin, a 6-1 190 pound DB from Alcovy HS in Covington, GA has Tweeted he's received an offer from UMass. UMass appears to be the first offer for Godwin. 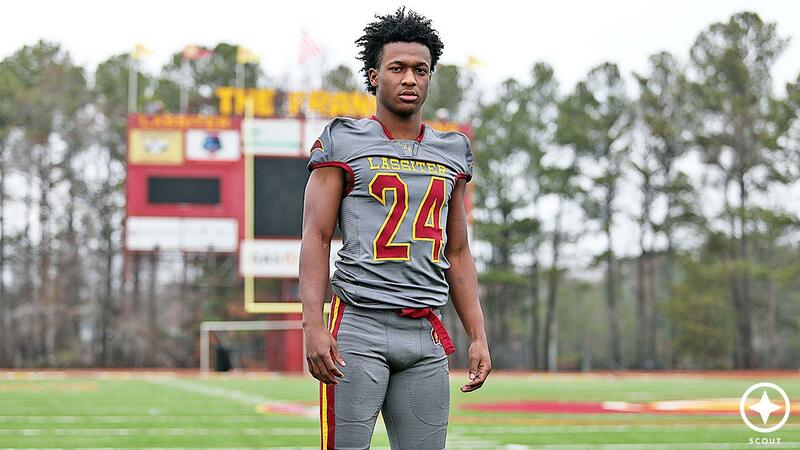 Christian Jackson, a 6-1, 185 pound DB from Marietta, GA has Tweeted he's received an offer from UMass. Jackson has 10 offers including Michigan and Michigan State. UMass is his only offer from the Northeast. 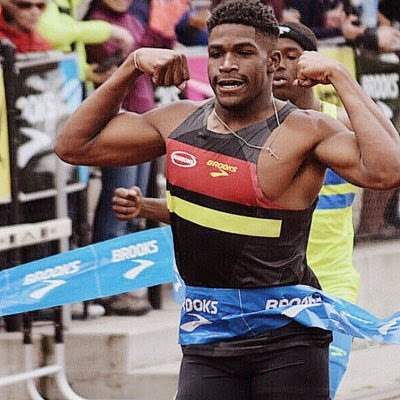 Joe Foucha, a 6-0 190 pound CB from New Orleans has Tweeted he's received an offer from UMass. "I’m going to be looking at how the school is, their environment, the coaches, the players,” Foucha said. So far the Louisiana safety has offers from Auburn, Memphis, Mississippi State, SMU, Texas A&M, Ball State, Cincinnati, Arizona, UMass, Texas, Arizona State, but has also been hearing from LSU, ULM and others. The 6-0, 190 safety is content to let the process play out and has no plans to cut down his list anytime soon. That said, there are a few schools that have impressed him so far with how much they’ve kept in contact with him. " 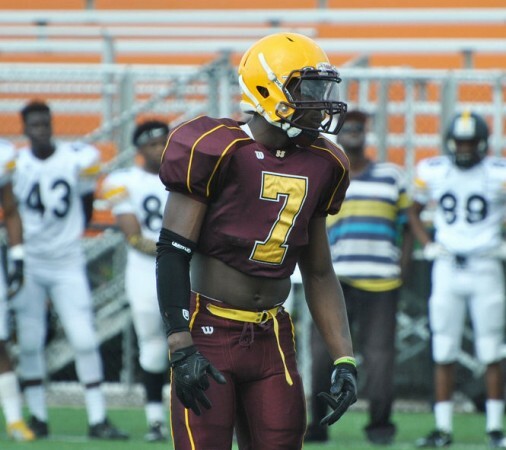 Foucha has 16 offers mostly from Power Five schools. UMass is his only offer from the Northeast. A 247Sports writer breaks down Temple's 2017 schedule. CSN Philly.com also contemplates the Owls's 2017 schedule. A SB Nation writer comments on Bryton Barr's seven years of eligibility. Old Dominion's plan to tear down and rebuild its stadium is getting positive feedback from the state assembly. Jamarcus Chatman, a 6-3 261 pound DE from Rome, GA has Tweeted he's received an offer from UMass. 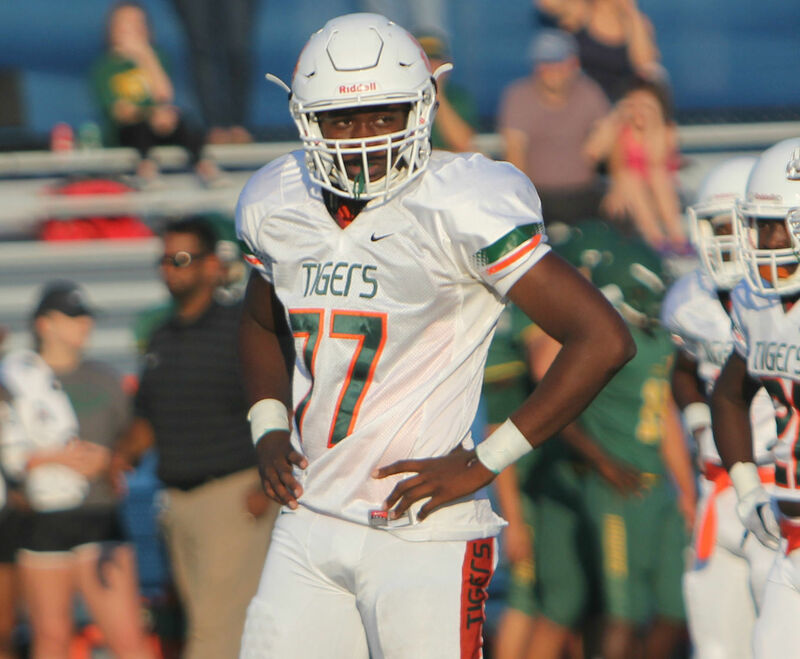 "Chatman is still waiting on his first SEC offer, but expect it to come soon. He is a prospect in the Peach State that is definitely on the rise. He is very strong, he plays with leverage, he is a high-motor kid on the field and he is one who could project as a five or three-technique on the next level. He would like to commit this spring." Chatman has 15 offers including from a number of Power Five schools. Besides UMass only Rutgers has offered from the Northeast. Thanks to "Chizzle" who first mentioned this in the comments. This article from Pressboxonline.com talks about his history of injuries. 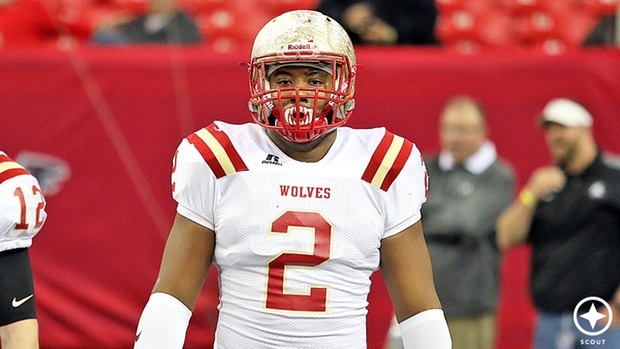 Barr was a 247Sports three-star player coming out of HS. 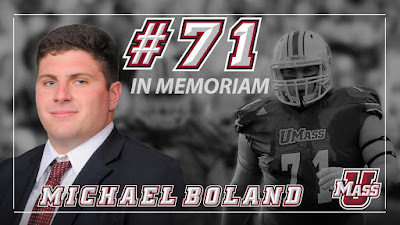 Mark Chiarelli of MassLve has a post on the passing of Michael Boland, Jr with lots of quotes from his teammates. Matty Vautour reports UMass will send a bus with coaches and players to Maryland so they will be able to Boland's funeral. Yahoo Sports has a post on Boland's death. The Spun.com has a story on the death of the former UMass captain. 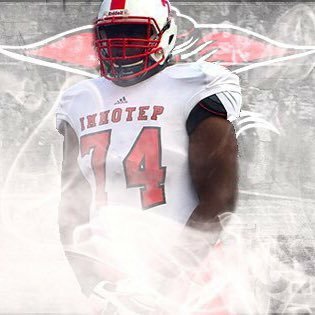 Former UMass recruit Antoine Webster was arrested for 2nd degree murder. Webster was part of 2016's recruiting class, but never joined the Minutemen. I blogged about Webster before. More from the Miami Herald. Mike Traini of "Fight Massachusetts" has a post on Webster's arrest. Ben Albert did not get the Georgia defensive line coach position. UPDATE: UMass has a post and a video tribute to Boland on their website. Matty Vautour has a post on the death of Michael Boland. Mark Chiarelli of MassLive has an article on Boland's passing and many Twitter comments by his teammates. Andrew Cyr of the UMass Daily Collegian has a short notice of Boland's death. Because of the International Dateline, UMass-Hawaii will open the 2017 season, just beating Stanford-Rice in Australia. FB Schedules.com has seven teams that benefited from easier schedules in 2016. 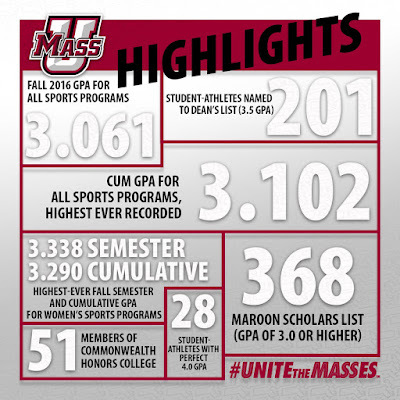 It would be nice if UMass was included in such an article some year. UMass ledgend Ben Albert is mentioned as a possible replacement for Georgia's defensive line coach. 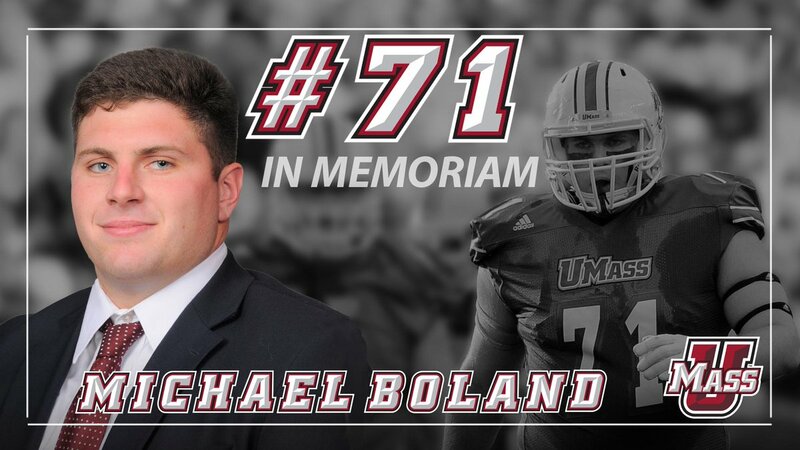 Michael Boland, 2016 UMass graduate and former starting OG for the UMass football team has passed away. My sincere condolences to Michael's family and friends. Image from the pregame huddle at Hawaii. Click for a larger view. SB Nation has a post about Coastal Carolina, our second game of the 2017 season. Mentions UMass. One of the main reasons the Minutemen have been wrong-footed since moving to FBS is 2011. You will remember we were ineligible for the CAA title because we had too many scholarships. UMass finished 2011 at 5-6 and lost four of our last five games in FCS. The Chants were ineligible for the Big South title in 2016. They finished 10-2 and were ranked on the top ten of FCS teams. UMass should have had about 12-15 JUCOS and FBS transfers in 2011. Followed by 12 more in the first year of Molnar's era. Basically nothing worthwhile was done in 2011 to prepare for the move. That year is still haunting us. USA Today has the five-year recruiting averages for Group-of-Five teams. Boston College is second-to-last in the entire group. Maxi Hradecny, who had an offer from UMass, chose Duquesne University. CBS Sports says Superbowl LI would have been better with college football overtime rules. The Worcester Telegram has a story featuring Rich Lewis, former Wachusett AD and former UMass football player. 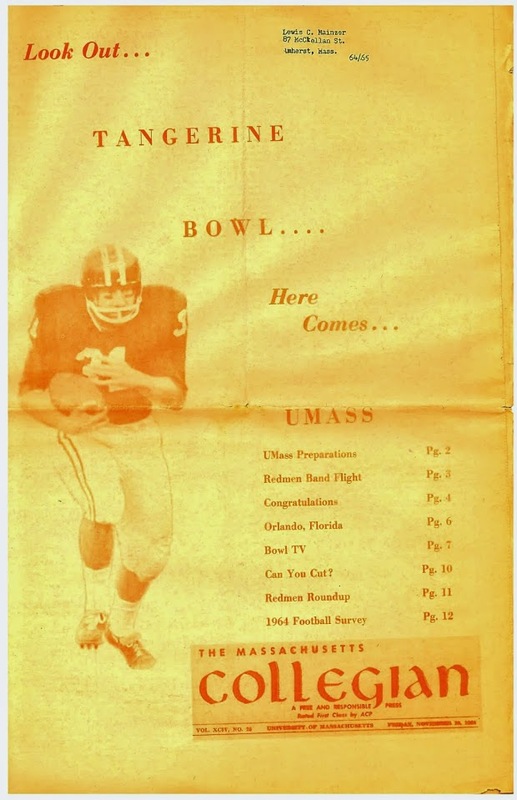 Richard Lewis lettered for the Minutemen in 1962 and 1965. Area coaches including Mike Hodges and Mark Whipple weigh in on Super Bowl predictions. The Worcester Sun has a post on Cole McCubery's signing with UMass. ONE THAT GOT AWAY-----TO RHODE ISLAND? Ivory Frimpong signs with the Rams. Frimpong's Hudl.com page. UConn signed Villanova's defensive coordinator Billy Crocker. Villanova led the CAA in scoring defense. Well, we're heading into the "slow news" portion of the year. I've been cranking out posts seven days a week since August. Unless we sign a defensive coordinator or some other major news, I'm going to start to take Sundays off until things pick up. Former NFL player Wade Davis spoke about gender equality during a visit to UMass. He also spoke with the UMass football team. Former UMass QB Gary Wilkos is enjoying life after football. Wilkos was one of the most impressive freshman QB's the Minutemen ever had. IMHO, he would have been an All-American if he had not been injured. The Pilot Online previews Old Dominion's 2107 schedule and thinks the Monarchs will have a tougher game in Amherst. Dan McGeough signs with Army. Victor Cruz is uncertain about his future with the Giants. Howard Herman of the Berkshire Eagle on UMass' 2017 recruiting class. DA Online has an article on how coaches recruit with a backup plan. Mentions UMass recruit Chris Hunt. The Union Leader mentions UMass walk-on Jake Froehlich. The Telegram cover UMass signeee Cole McCubrey and has some video. Like the UMass banner in the background. UMass target Jaylen Hall signed with Western Michigan. Gerrick Vollmer signs with Virginia. Sekai Lindsay signs with DII Florida Tech. Dan Malone has a post on UMass' recruiting results from yesterday. Dan also has a post on the recruiting rule change that allows a school to bring in a recruit's parents. Matty Vautour has a story on the 2017 recruits. Mike Traini has "What we learned on the 2017 National Signing Day". Kyle Deluz of the UMass Daily Collegian has a post on the 2017 recruits. The Boston Herald covers UMass' Signing Day. 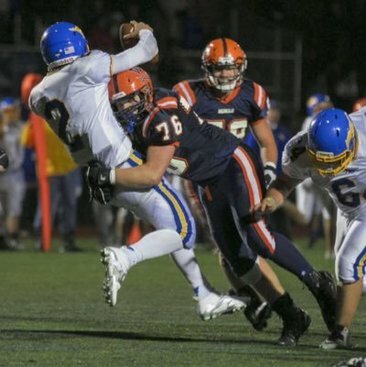 UMass OL recruit Brian Abosi is featured by Worcester Telegram. No Group-of-Five team signed any of New Jersey's Top-50, but UMass grabbed two of the next group. Don Brown poached several top Connecticut recruits. 247Sports has the Minutemen's class at #108 out of 128. That would have put us 9th in the MAC and in the middle of most of the Group-of-Fives recruiting hauls. Boston College signed 16 three-star recruits in their annual bottom-of-the-ACC ranking. So don't expect UMass to do much wining against Power Five squads. The UMass defense finally receive a recruiting focus. Fourteen of the 22 recruits are on the defensive side of the ball. Six of the eight three-star players play defense. The Minutemen certainly strengthened their defensive backfield that was consistently beaten by Group-of-Five offenses. Three three-star linebackers should also help. The defensive line should also be deeper. The Minutemen also filled a need at WR. Beyond Andy Isabella, UMass did not get a lot of production from their wide receivers. UMass added size with Jacoby Herring and Melvin Hill. Jesse Britt could help at slot receiver. One thing that did not get fixed is UMass' #124 ranked rushing offense. The Minutemen only have two scholarship RB's and did not sign one yesterday. I would expect Whipple to add a RB in the Spring or before Fall camp. 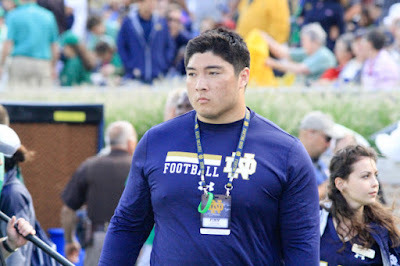 Both scholarship offensive linemen look to be projects. All-in-all a solid FBS class. Eight three-star players is good for where we are now as an Independent. Adding a late three-star RB and maybe a OL fifth year transfer would push the class into the "very good' region. 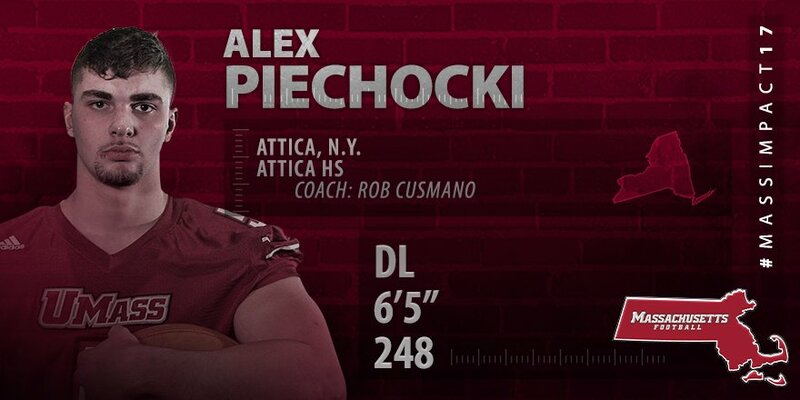 Alex Piechocki, a 6-5 248 pound DT commits to UMass. I've blogged about Piechocki before. This article from yesterday's Daily News features Piechocki's verbal to UMass. The UMass Twitter feed reports J'yvon Brown, a 6-4 190 pound Athlete from Irvington, NJ has committed to UMass. I've blogged about Brown before. 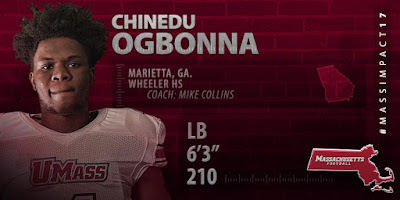 Chinedu Ogbona, 6-3 200 OLB from Wheeler HS in Georgia has verbaled to UMass. I've blogged about Ogbona before. Chose UMass over 11 other offers including Troy, Old Dominion and Tennessee. Today is the High Holy Day of College Recruiting. Follow the recruits as their faxes arrive in Amherst on @UMass Football. Today's a busy day for me (figures). I'll try to have some posts on players that just commit today or are new to the recruiting news. 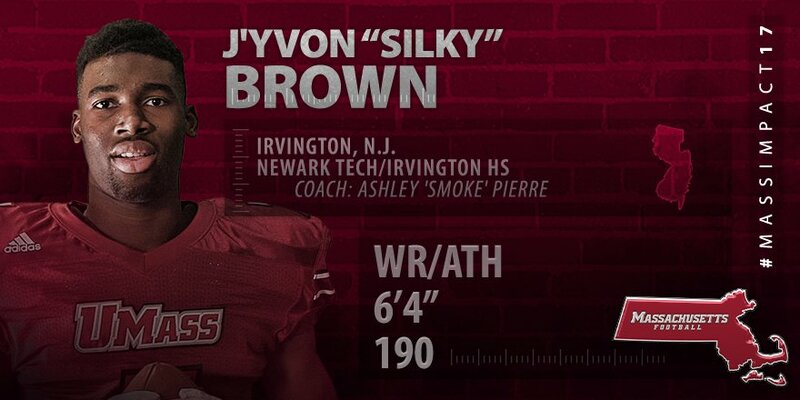 In addition, UMass will have a live signing day show on ESPN3 at Noon EDT.